The "Naivedhyam" for navarathri is mostly Sundal(Sweet or Salt)in the evenings. Puttu is made on a Friday of Navarathri. 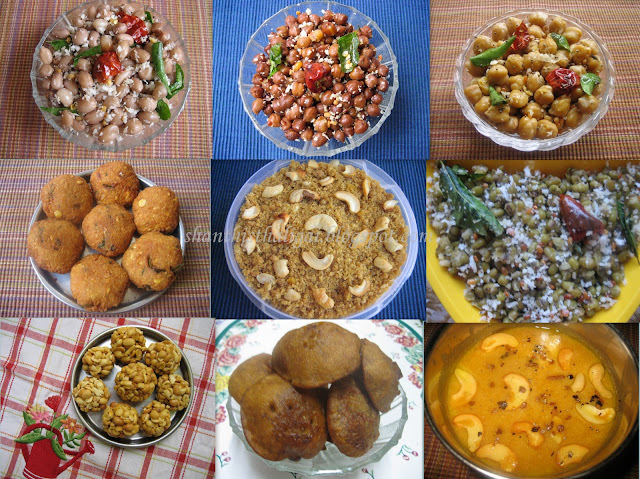 Kondakadalai (Black chana dhal) sundal and appam is made on Saraswathi Pooja day. Some make kadalai urundai also. Payasam is also made daily. Apart from green gram sundal I have given links to all the sundals and payasams towards the end of this post. HAPPY NAVARATHRI. Dry roast green gram and soak in water for half an hour. Pressure cook with salt for two whistles or until soft. When the pressure is released, take out, drain the water completely and keep it aside. Heat oil and temper with the given ingredients. Add scraped coconut and saute well for a minute. yummy delicious sundal...my favourite.I love the navarathiri menu . I too enjoy the sweet sundal, nicely arranged and detailed. Lovely clicks too. Lovely recipes for the occasion..and handy too..
Love green gram sundal, wonderful array of beautiful dishes.. Tempting and yummy... looks so tempting!! Luv this Sundal as it luks tasty and healthy. very beautifully guided and presented with lovely pictures of the various items which r tempting. Love it a lot! So flavorful it is! Nice spread of dishes. Looks too good. Nice collection of sweets and sundals for Navratri.